Growing up in an Asian American household, we never did Christmas cards. My dad always carried a camera, taking tons of pictures of us, but we never had a professional family portrait. This is a concept that my parents, along with many other Asian immigrants, aren't used to. Hiring a photographer and personalizing cards, every year, is a very excessive and obscure idea. It actually wasn’t until my parents immigrated here, that they started celebrating Christmas. Since it’s such a big holiday, in America, my mom wanted my brother and I to feel accustomed to the culture. Although my mom was Buddhist, she did this to bring happiness and inclusion to our family. It has been my favorite holiday, for as long as I can remember, and I look forward to it every year. This is my first time doing Christmas cards, and I got to share this moment with Basic Invite. My boyfriend and I happened to meet during the holiday season, so this is the perfect way to cherish that memory. Basic Invite has over 500 holiday cards, so I was overwhelmed by the many choices. I gravitated towards the foil finishes, which is available in gold, silver and rose gold. Aside from foil, the main customizations they offer are over 40 envelope colors and over 180 graphic colors. Once you choose the card you want, you can edit the fonts and colors, in any way. Other useful services they have are custom samples and an address capturing system. Before placing a large order, you can request a sample to see what the final design looks like. To make collecting names and addresses easier, you will be given a link that can be shared on any social platform. Your loved ones can fill out their information, if they wish, and the best part is that address printing is free for all Christmas orders. Instead of using their customized shipping method, I chose to bulk order a small batch to my house. Even though the estimated delivery was three weeks, I received my order within ten days. The cards came professionally packaged in a tiny stuffed box. It even included a complimentary paper ornament with our photograph. The cards were beautiful, but the color and lighting of the pictures were off. It was slightly darker than what I submitted, but I decided to keep them, anyways. I didn’t want to wait another two weeks for a reprint, but the option is there, if you aren’t satisfied with the quality. Basic Invite has a “Love It Guarantee,” where they will issue a full refund or reprint the cards to meet your standards. I’m always open to new experiences, so I wanted to give Christmas cards a try. Would I do it again? Meh, maybe every five years, or so. As festive and aesthetically pleasing as it is, I don’t see the point in having them, unless I’ve reached a new milestone. Once I get married or have kids, I’d definitely to do this again, but for now, I’ll lay low. Although I’ve never understood holiday cards, this won’t tarnish my love for stationary. 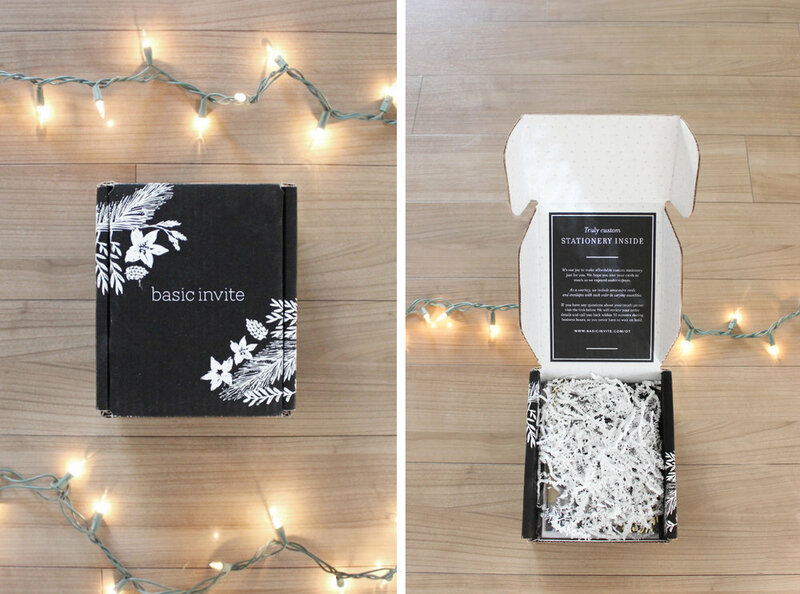 Basic Invite covers all sorts of events and announcements, like births, birthdays and weddings. Creating holiday cards might not be my thing, but that doesn’t mean I don’t enjoy receiving and collecting them. If you’re a Christmas fanatic, who lives for these traditions, then I highly recommend Basic Invite. The customer service is extremely accommodating, the process is user-friendly and the designs are endless. The website walks you through every corner of the card, making sure that it’s everything you want.